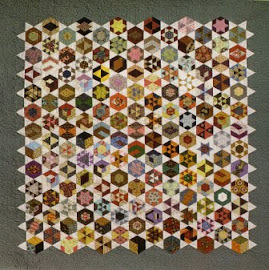 I have admired miniature quilts for a while, especially those that are reproduction styled, they remind me of the beautiful little dolls quilts that were made for little girls 150 years ago and are great collectors items now. Check out these little beauties on the Rocky Mountains Quilts site. I love to see these small quilts hung together on a feature wall. Kathy from Inspired by Antique Quilts has a gorgeous wall full of quilts she has made. I love it! I am a long way from a wall full of quilts but am happy with my first miniature. Made from fabrics from my brown stash, handquilted and bound with a single thickness binding that Jo Morton uses. I really like that little quilt Penny. Do you have a pattern for it, or just a "mud map" on how to make it? I do have the pattern, in three sizes, this is the miniature. Would you like it?